In Megacatastrophes!, we are treated to a light-hearted tour through a number of candidates (in fact, far more than nine…) for how the human race could eventually end. From grey-goo to supervolcanoes, ice ages to black holes produced by the LHC, the authors give us a run down of the history and science behind each possibility, explaining in plain language their effects on the human race and planet Earth and as a whole. Each disaster is covered in detail, although the authors betray their backgrounds by giving considerably more space to some, like gamma ray bursters and superflares, where their language also becomes a bit more technical. Each chapter is full of interesting facts and views of real life analogues or examples of the processes that are described. The book is entertaining and easy to read, but ultimately it is a ‘pop-sci’ book that leaves the more complex investigation of the possible effects of each disaster to other authors. A description of what would happen to us puny humans is largely missed in many of the chapters, except the treatment of asteroid impacts, which is much more human-centric and benefits from a slightly longer look at how society would be affected. The arbitrary addition of a ‘Catastophometer’ grading of each disaster is a little patronising and redundant – the writing speaks for itself. 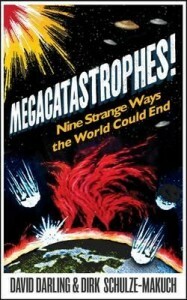 As an introduction to the end of the world, Megacatastrophes! does its job well and provides a list of further reading for those who are interested in a more detailed treatment. It is not a hard science book and doesn’t seek to be, but rather seems to be a friendly and overall optimistic response to the general ‘2012’ syndrome that is hitting headlines at the moment.